We offer the ideal location for exploring the island’s endless enchantment. 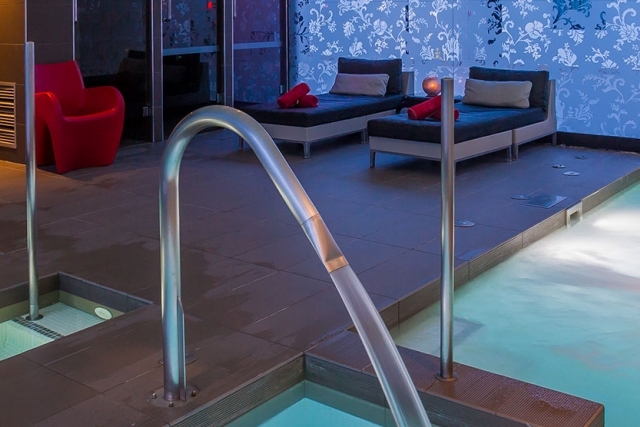 Make the most of your Ibiza holiday by staying at Migjorn Ibiza Suites & Spa! Migjorn Ibiza Suites & Spa offers exclusive accommodation in fully equipped suites: small Ibiza-style chalets allow you to enjoy the comfort and intimacy of an apartment, with all the facilities and services of a proper hotel. For this reason, Migjorn Ibiza Suites & Spa is the ideal option for a perfect holiday experience. Migjorn Ibiza Day, Migjorn Ibiza Night was created by our designer as a harmonious aesthetic concept, two sides of a single reality, reflecting two ways of experiencing, feeling and enjoying our little Ibizan oasis. We provide suites of varying size, able to accommodate between 1 and 6 people. All are fully equipped, with a light and airy ambience as well as plenty of space. The majority are duplexes or triplexes, each one different from all the others. There are also suites with interior staircases. The different categories are as follows: Junior Suite, Superior Junior Suite, Suite with Two Bedrooms, Residence Suite, and Sanctuary Suite. Check online to see what’s available in each category, and then make your personal selection! All our suites have 1 or 2 bedrooms, a living/dining room with convertible sofa bed, fully equipped kitchen and full bathroom. In addition there is an excellent Wifi connection, air conditioning, heating, plasma TV, outside phone line and safe-deposit box. 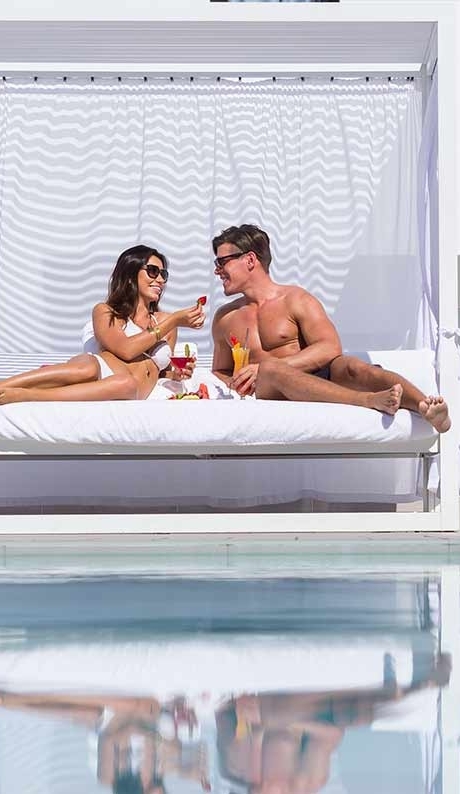 Migjorn Ibiza Suites & Spa provides a wide range of services and also includes luxury facilities to ensure your stay on Ibiza is quite simply unbeatable. Enjoy our two swimming pool areas, the exclusive Unic Restaurant, Pool Lounge Bar, our new VIP area for business, the gym, hairdressing salon, supermarket, play area for children, and of course, the relaxing Spa Essence, where you can lie back and enjoy exclusive water therapies; the facilities here for your enjoyment and wellbeing include an ample range of treatments for beauty plus therapeutic and relaxing massages. 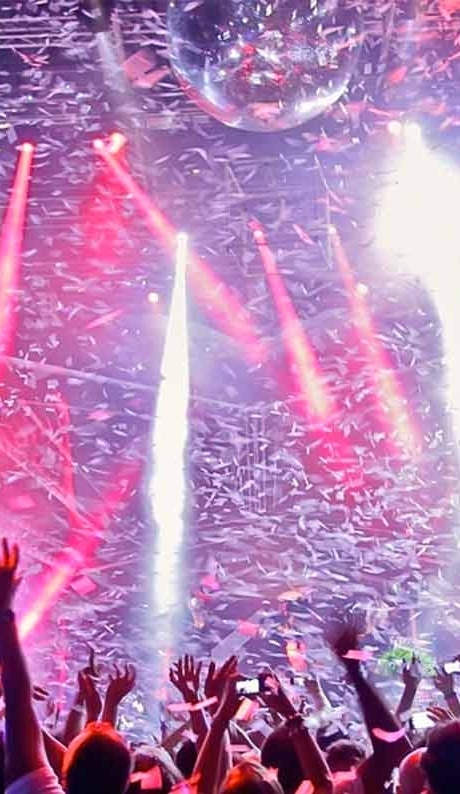 Don’t miss out on this amazing Migjorn Ibiza experience. Migjorn Ibiza Suites & Spa prides itself on catering to our clients’ every whim, which includes truly delicious gastronomy. 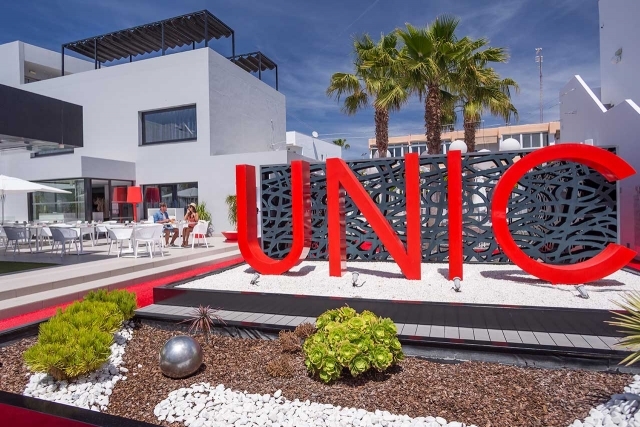 Provision in this area centres on the Unic Restaurant, which specializes in the fusion of Mediterranean and French cuisine, using local ingredients that are in season. You are sure to succumb to its many novel and original gastronomic creations. Likewise, you can enjoy our cocktails in the Pool Lounge Bar next to the swimming pool, and our superb breakfast buffets in the Es Migjorn Room. Migjorn Ibiza Suites & Spa, an oasis at the very heart of Playa d’en Bossa, provides everything you need to be sure of that perfect Ibiza holiday. Don’t hesitate to get in touch with us if you need further information. We’ll be delighted to help! Migjorn Ibiza Suites & Spa offers exclusive accommodation in fully equipped suites: small Ibiza-style chalets allow you to enjoy the comfort and intimacy of an apartment, with all the facilities and services of a proper hotel. Our privileged location is complemented by a wide variety of services and facilities, our priority is your satisfaction and enjoy an unforgettable holiday in Migjorn Ibiza Suites & Spa. Our second visit to Migjorn having discovered it last year. Very attentive staff throughout the whole complex from reception through to breakfast and the great bar staff. Rooms are the best I’ve stayed in Ibiza and have been visiting the Island since 1990 - we’ll definitely return here due to everything mentioned above and it’s location in the centre of playa den bossa. We arrived a few days ago and the receptionist and all staff is really professional and friendly at all the time . For us is one of the best place in Ibiza , where to spend really nice time enjoying all service . Was a really pleasure , see you next year. Stayed for a few days at the start of October 2018. This place is utterly gorgeous. The staff are incredibly friendly and helpful, the suites are clean, well laid out and spacious with two balconies and the breakfast is to die for. Right in the heart of playa d’en bossa and next to the beach. If you don’t go for beaches then the hotel has two stunning pools on offer. Highly recommend. We travelled as a large group of 8 mums and kids (16-24 age range) and none of us could fault the wonderful Migjorn Ibiza. The staff are awesome , Max must get a mention and Marcell who runs a very cool pool par with excellent cocktails and the music is just the perfect vibe to take you through the day by the pool. The whole place is spotlessly clean and everyone who works there seems to be happy and ready to smile. The breakfast is incredible and all our kids, who enjoyed the Ibiza nightlife to its max, always got up in time to ensure they didn’t miss out. Freshly made omelettes, loads of choice of hot and cold, plus beautiful fresh fruit. Thank you Migjorn - we will be back next year. I have been to Ibiza over 25 times, and probably stayed here around 10 of those. The location is impeccable, the rooms are more like apartments with all the facilities you could require (small kitchen, fridge). The breakfast spread is one of the best of all the hotels in Bossa with everything from caviar to cava, fresh to order omelettes, fresh bread, fruits, salmon, pastries... the list goes on. There are numerous facilities on site from a hairdresser to a gym, spa, and sauna, but what really makes this place special is the staff. The front of house staff are fantastic - specifically Pepa, as well as Alicia and Elena - extremely friendly, helpful and always smiling, which must be tough given they work in Bossa and have to deal with with a variety of clientele. And, of course, this review would not be complete without mentioning the pool area which is run by the incredible Marcelo. Friendly, efficient, helpful, he keeps the area buzzing with his warm personality and humour, and curates the music perfectly - with many of his own mixes adding to the mood and atmosphere. Stay here. You won’t regret it. Migjorn Ibiza Suites & SPA, an Ibiza oasis. 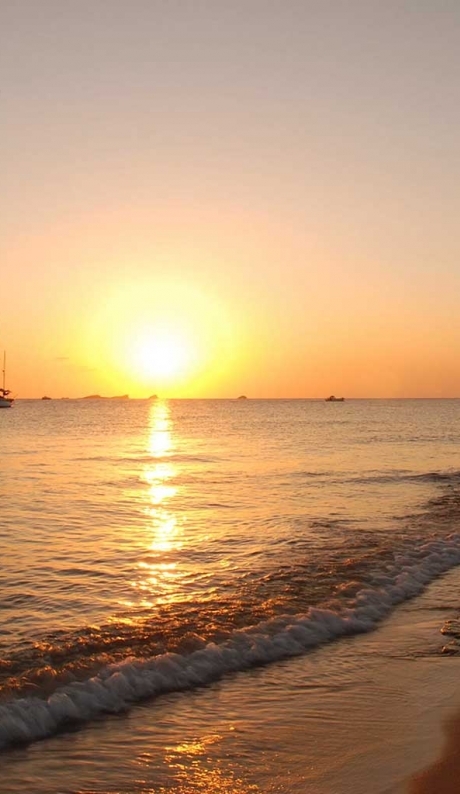 Ibiza is an idyllic place, a perfect location to forget about the world. Its beaches of fine sand and crystal clear waters, as well as its wide variety of leisure and accommodation options, make it an authentic holiday paradise. It is one of the destinations that offer a great offer of luxury hotels and a special attention to detail with which to satisfy the thousands of tourists who come to the island throughout the year. One of the most important and most prestigious areas is Playa d 'en Bossa. Better than any luxury hotel in Ibiza, Migjorn Ibiza Suites & Spa, is an innovative and different concept of accommodation, located in the surroundings of Playa d 'en Bossa, as the perfect holiday option. Considered the ibicenco oasis par excellence, it merges a new concept of accommodation with the essence of Ibiza. Our facilities, with a modern and minimalist touch, pretend, with their small white casitas-suites, to pay tribute to the authenticity of the island and its beautiful corners, inspired by the purity of the white color of Dalt Vila and the rest of the "Island Pretty". Migjorn Ibiza, better than a hotel, with a perfect location in Playa d 'en Bossa, has Suites of a spectacular Ibiza minimalism, taken care of in detail and with capacities from 1 to 6 people, perfect for coming as a couple or with friends the island. They have all the facilities, fully equipped and the vast majority of duplex or triplex style, although there are also suites without interior stairs for those who want it. All of them, preserve the luxury of the Ibicenco, better than a hotel, with all the necessary comforts: Junior Suite, Superior Junior Suite, Two-Bedroom Suite, Residence Suite and Sanctuary Suite. These are suites with one or two bedrooms, kitchen-dining room, living room with sofa bed, kitchen and bathroom. Our two pool areas, Spa Essence and wellness area, the Pool Bar Lounge, and the extraordinary UNIC Restaurant, make Migjorn Ibiza Suites & SPA, a different and cozy concept. Better than any luxury hotel in Ibiza, with an enviable reputation, Migjorn Ibiza offers experiences, both at the accommodation level and at the level of health and beauty, and, of course, gastronomically. Two of the advantages compared to other hotels in Playa d'en Bossa, are the wellness and gastronomy options that you can find. On the one hand, Spa Essence is a water circuit and an area for therapies and massages, perfect for those who want to relax. Its treatments and its water circuit do not leave anyone indifferent. On the other hand, its spectacular Unic Restaurant, is one of the trend restaurants in the area. After his appearance in several television programs, and his commitment to creativity and perseverance, has confirmed his already in itself, good reputation. Its chef, David Grussaute, one of the forerunners of haute cuisine in Ibiza, with an original fusion of French and Ibizan cuisine that respects the essence of the island's products, has captivated the palate of its guests with its fresh creations and amazing. All this makes Migjorn Ibiza Suites & SPA the perfect paradise in which to get lost on the island. Better than any luxury hotel in Ibiza, with all the facilities one could imagine, and in which you will forget the world. A new concept of accommodation, more than you would expect from a hotel and a holiday, and also, in a perfect area, the Playa d 'en Bossa area. It will fascinate you and you will not want to go home.